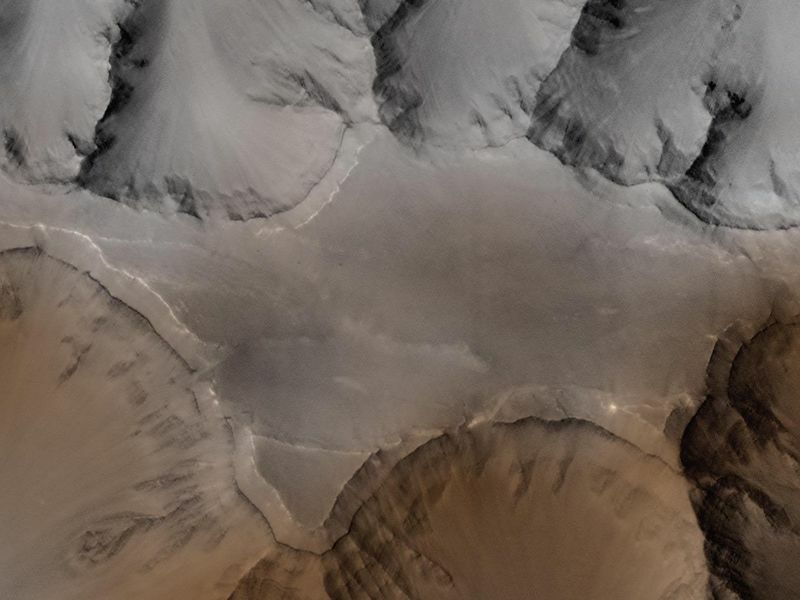 This picture of Coprates Catena (14.7°S, 55.8°W) was obtained in the early evening of January 1, 1998 by the Mars Orbiter Camera (MOC), shortly after the Mars Global Surveyor spacecraft began its 80th orbit. 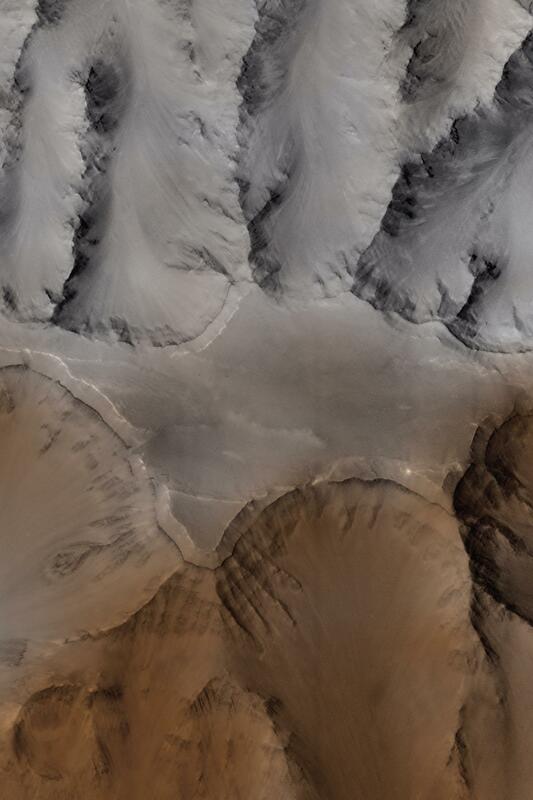 The image covers a tiny fraction of the Valles Marineris canyons (that stretch over 4000 km, or 2500 miles, east-west) at very high resolution: it extends only 10 km by 12 km (6 mi by 7.5 mi) and captures features as small as 6 m (20 ft) across. Slopes descend to the north and south (upper and lower part of image, respectively) in broad, debris-filled gullies with intervening rocky spurs. Multiple rock layers, varying from a few to a few tens of meters thick, are visible in the steep slopes on the spurs and gullies. Layered rocks on Earth form from sedimentary processes (such as those that formed the layered rocks now seen in Arizona's Grand Canyon) and volcanic processes (such as layering seen in the Waimea Canyon on the island of Kauai). 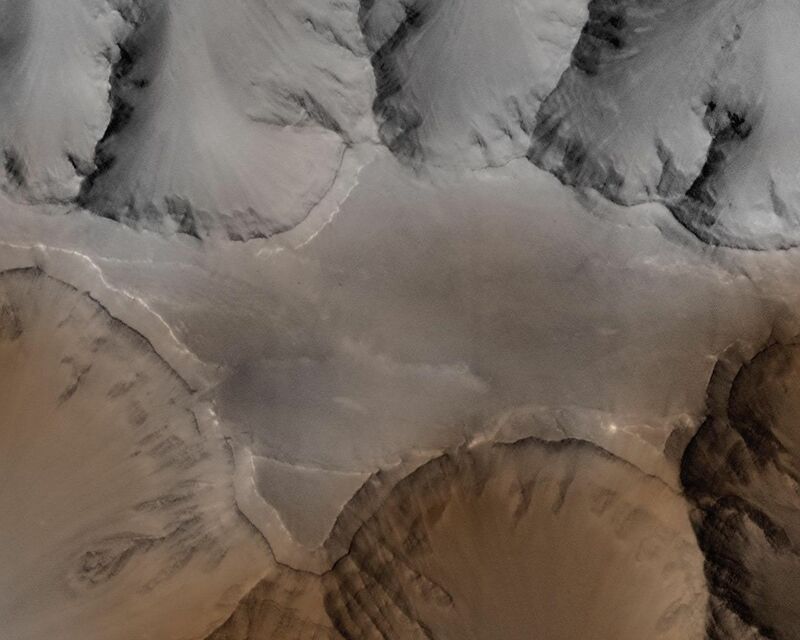 Both origins are possible for the Martian layered rocks seen in this image. 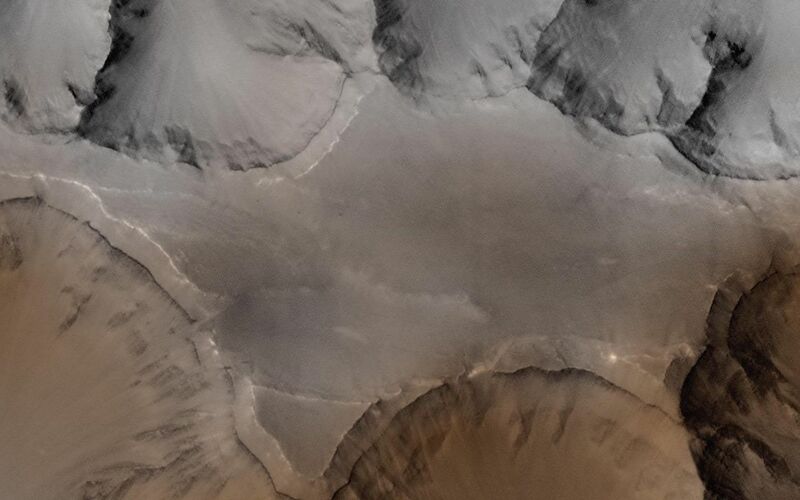 In either case, the total thickness of the layered rocks seen in this image implies a complex and extremely active early history for geologic processes on Mars. Low-resolution Viking color images were used to "colorize" this frame. The process takes the red, green, and blue (RGB) low-resolution images and transforms them to hue (color), saturation (whether the colors are bold or pastel), and intensity (the brightness of the scene), or HSI. The high resolution grayscale image is then used to replace the low-resolution intensity image, and the images are transformed back to RGB. The colors were additionally modified to appear less saturated and more "Earth-like."